Between eBay, private sales and auction houses a large number of tethered cars appear on the market each year. The commercial ones are usually easy to identify, while the homebuilt ones are much more difficult to attribute. What most of them share in common is that they are anonymous and have no recognisable history. On rare occasions a ‘gem’ like the ‘Stubbs Austin’ or Bernard Manley’s cars turn up, where the history, is known and documented (although not necessarily by the vendor). Provenance with cars is like any other item, it adds immensely to its importance, and value. At the beginning of June, two cars were offered for sale on eBay, both with a known history and one with impeccable provenance. They were true ‘garage finds’ having been recovered from the corner of his garage, following the death of the original builder. OTW is most grateful to Clive Jones for supplying the pictures and information that led to this ‘Pitbox Special’. 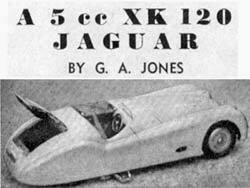 On page 749 of the Model Maker for November 1952 a 5cc Jaguar XK 120 tethered car is featured that was built by G.A. Jones, Clive’s dad. 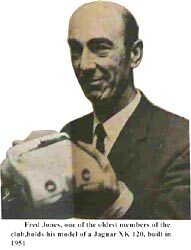 Mr Jones senior, actually F.A, the first of the errors in MM, was an engineer working for Tony Vandervell, an automotive parts manufacturer in Maidenhead, who introduced the ‘Thinwall Bearing Shells’ that changed car engines forever. Vandervell was also responsible for the ‘Vanwall’ racing car and engine, and that story alone is well worth reading. Mr Jones wrote to Model Maker pointing out the errors with his name and the chassis material, but this does not seem to have been printed. In February 1973, the Maidenhead Advertiser published a feature on the opening of the new clubroom of the Maidenhead Model Makers Club, and in one of the pictures, Mr Jones can be seen holding the Jaguar. Mr Jones was a founder member of the Maidenhead Club and worked in a slightly smaller scale. 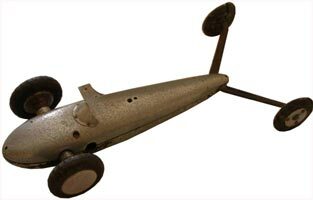 The first of his two cars was the Jaguar, with a very accurately modelled balsa body concealing an effective and functional tether car chassis. 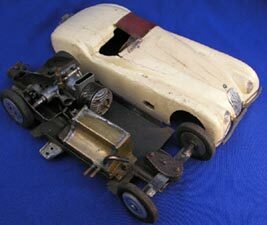 The car was built entirely from scratch and used a Frog 500 driving the rear axle through 1.5:1 ratio spur gears. 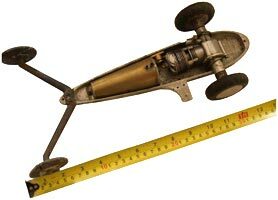 With the Frog having its mounting lugs way above centre, a conventional spur mount was of no use, so one was fabricated out of 16g steel to take the motor and the axle bearings. According to the original write up, the chassis was originally 16g aluminium, but this turns out to have been another error in reporting, as it was actually steel. At the rear of the chassis was a socket for connecting a glow battery while pushing off the car. 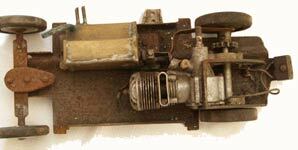 A conventional fuel tank and knock off along with a panhandle to give clockwise running completed the chassis. 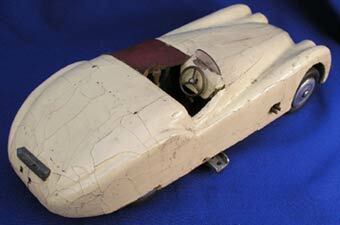 The body to 1/14th scale is a work of art, being carved from block balsa. The body is just on 12" long and is fully detailed with lights, bumpers, number plates, aero screen and tonneau cover. 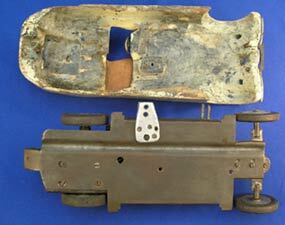 An opening boot lid enabled the push stick to be applied directly to the chassis. On its first outing at the Chiltern Club’s Woodside track just outside Luton, the car did 50 mph and to quote MM "should be a very satisfying performer". Fast forward 35 years and this very car appears on eBay in the condition as seen in the pictures above. 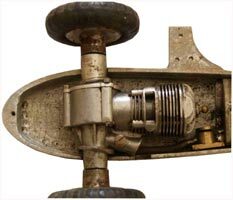 The flywheel and spur pinion have disappeared at some stage and the steelwork is somewhat rusty, but otherwise the car is complete and can be clearly identified. The paintwork on the body is badly cracked and the opening boot was glued shut when the car was put on static display, but apart from these cosmetic problems, the car is as built in 1952, even down to the tonneau cover. It is rare that a car with such a superb provenance comes up for sale and a final price of £465 shows the level of interest. Happily it has gone to a UK buyer and with a bit of engineering and some TLC should be a valuable addition to their collection. The second of Fred Jones’ cars was a much more functional affair, and again very well engineered, but unfortunately, very little is known about it. 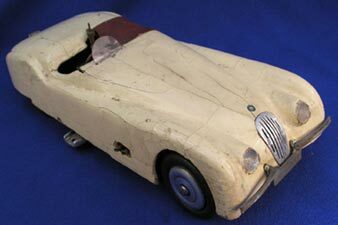 Built purely for racing, the car is very typical of what was appearing on tracks in the early to mid 50s. Power unit is again a Frog 500 glo motor, but this one has been converted to a twinshaft configuration with a very neat rear housing and axle. The Frog has had its mounting lugs removed and is secured by two U bolts round the shaft bearings. 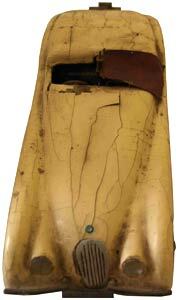 A two-piece pan in the style of a ‘Bottoms Up’ is used, but with the car running as a 'teardrop', driving wheels at the front. The smaller rear wheels are widely spaced and mounted well behind the car on outriggers. A deflector on top of the car helps extract the exhaust, while an intake on the side matches up with the front mounted venturi on the motor. There are no obvious inlets or outlets for cooling. The rear tyres look as if they were originally intended for some other type of vehicle as were the fronts, but these have suffered badly over time. A single panhandle attachment, again for clockwise running, completes this very nice looking competition model. Sadly it has not been possible to establish any history for this model, but with a new set of wheels and tyres all round would be ready to go in a vintage competition. Without the same level of documentation, the bidding for this car was a little slower, eventually going to the USA for £261.50. Being able to tie cars to a particular builder is most unusual, and so it has been a pleasure to be able to record the story of Fred Jones' two fine cars. Dec 08 Thanks to David Giles for pointing out the anomalies in the original description of the 'teardrop'. Mike Hindell has very kindly sent us this new set of photos of the XK Jaguar, which is looking significantly better after a thorough clean. 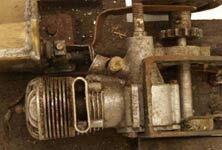 Mike has not told us whether he is going to try and locate a drive gear and flywheel to complete the car. The body of the Jaguar illustrates a common dilemma with cars of this age. The paintwork has crazed, and some would re-finish it, but in our view it is not sufficiently bad to warrant losing the patina and age that it has acquired in the last 63 years. The fold in the chassis is an interesting feature and begs the question as to whether the material was recycled from something else. Not too many cars retain the battery socket at the rear where the glow battery would be plugged in whilst the car was being pushed off.